As Georgia’s Republican Candidate for Governor, Kemp would tell anyone willing to listen that he is not in favor of voter suppression. As Secretary of State and the man responsible for elections in Georgia, he would downplay the Associated Press analysis that shows 70 percent of the 53,000 voters he purged with his flawed “exact match” system were black. He would dispute the APM report that a disproportionate number of black voters were among the 107,000 voters purged from rolls using the “use it or lose it” law. Kemp would even dispute the ACLU lawsuit that alleges that Kemp’s office threw out at least 600 absentee ballots, including 1 in every 10 in the state’s most diverse county. Yet, despite Kemp’s assertions that he is simply trying to prevent voter fraud (which coincidentally, happens about as often as Kanye saying something smart or Donald Trump telling the truth—almost never) audio doesn’t lie. Rolling Stone has obtained audio of Kemp at a “Georgia Professionals For Kemp,” dinner where Republican supporters donate the extra money they saved on chicken seasoning to Kemp’s gubernatorial campaign. The fundraiser was held at the Blind Pig Parlour Bar, the winner for the most subconsciously racist restaurant name of the year, 1982- 2018, narrowly beating out Cracker Barrel each year. In the leaked audio, Kemp confesses his concerns about the get-out-the-vote for Stacey Abrams campaign. And as worried as we were going into the start of early voting was the literally tens of millions of dollars that [the Abrams camp] are putting behind the get-out-the-vote effort to their base. A lot of that was absentee ballot requests. They have just an unprecedented number of that,” he said, “which is something that continues to concern us, especially if everybody uses and exercises their right to vote—which they absolutely can—and mail those ballots in, we gotta have heavy turnout to offset that. Let’s dissect this for a second. Here we have the man whose primary job is protecting and promoting the citizens’ right to vote telling people that his political success as a candidate for governor is diametrically opposed to the job he now holds. The man charged with upholding the integrity of Georgia’s ballots saying he is “concerned” about people exercising their right to vote should be an impeachable offense. And just in case you don’t speak the Georgia dialect of Caucasoid, that “base” to which Kemp repeatedly refers is black people. White voters in Georgia overwhelmingly vote Republican while nearly 90 percent of the state’s black voters are unwavering Democrats. This is not Kemp’s first time being caught on tape making these kinds of remarks. 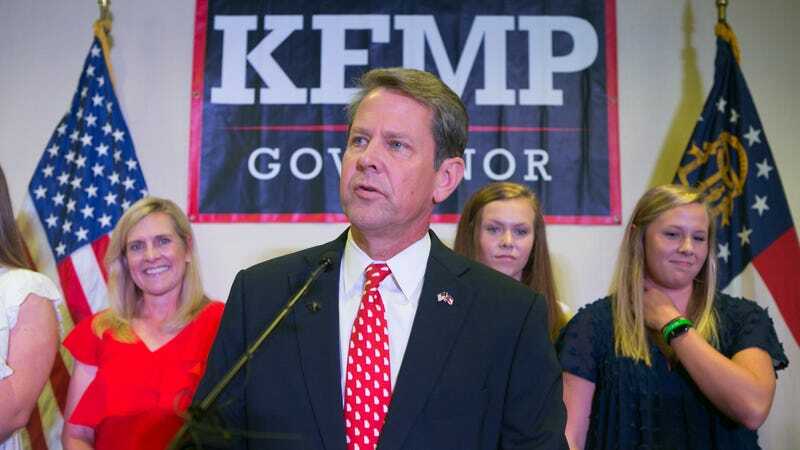 In 2014, Kemp warned his Republican supporters that Democrats “registering all these minority voters” could cause the GOP to lose the election. Again, for Republicans like Brian Kemp, cheating is not a last resort.